Gerald and Patty Harvey met while enrolled at ACU. Acclaimed impressionistic artist Gerald Harvey Jones (’56), died Nov. 13, 2017, at age 84. A public memorial service is being planned to take place in Austin, Texas, sometime in the early spring of 2018. Harvey was born Nov. 1, 1933, in San Antonio, Texas. 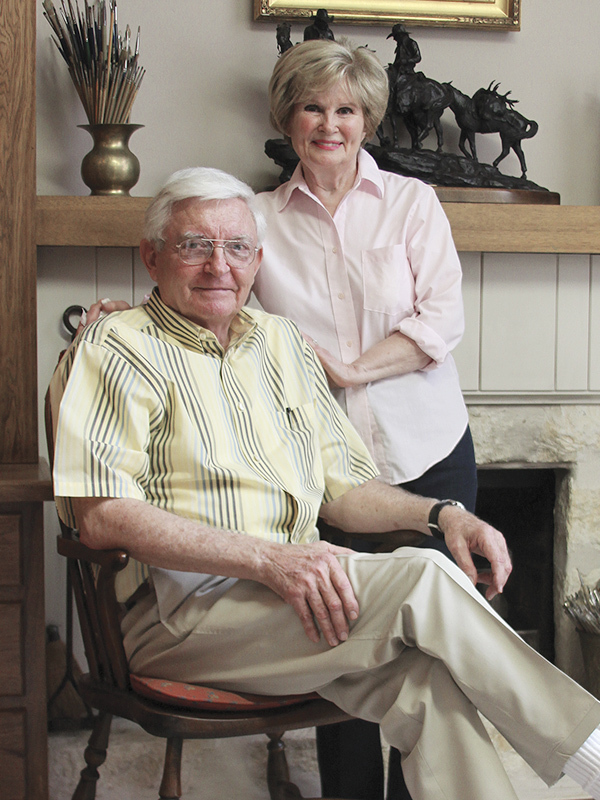 He met Patty Marie Bentley (’55) while attending ACU for two years and majoring in industrial arts education. He graduated from the University of North Texas in 1956 but did not start painting until 1957, when Patty bought him an oil paint set while he was a junior high industrial arts teacher in Austin. Known professionally as G. Harvey, he developed into a painter and sculptor whose portrayals of the American West, the Civil War and street scenes in turn-of-the-century America were collected by U.S. presidents and governors, and other art aficionados around the world. His paintings appeared in galleries and sites such as the White House, the National Archives, the Treasury Building, and in a year-long exhibit – The All-American Horse – at the Smithsonian Institution’s Museum of Natural History in the early 1990s. The Smithsonian commissioned him to paint The Smithsonian Dream to commemorate its 150th anniversary in 1995. The G. Harvey Room in ACU’s Hunter Welcome Center displays several large pieces of Harvey’s work, as well as Museum Visit, one of his original oil paintings. He was preceded in death by his parents, James Drayton and Myrtle Payne Jones; and a brother, James Drayton “Bud” Jones Jr. Among survivors are his wife, Patty; a son, Gerald Jones Jr.; a daughter, Pamela Taylor; four grandchildren; and two sisters, Janis Howell and Lavern Fitch. Gerald Jones was the most creative person I have ever known. The man could create and construct anything. I didn’t realize I was witnessing one of the greatest American artists ever when Gerald’s son Jerry and I would run through his back porch painting studio at their home on Geraghty Street in Austin. We were bulls in his sacred artist world. He would tell us what he was thinking and doing then we would run outside to play. Just now I had a flashback and can still smell the oil paints and turpentine just like it was 1962. Patty was an amazing wife and mother and to know she got Gerald started in his painting is just amazing. Thank you master artist and man Gerald Jones. What a gift you where!